At the central police station in the Center of Kampala City, some Indians were seeking police protection. 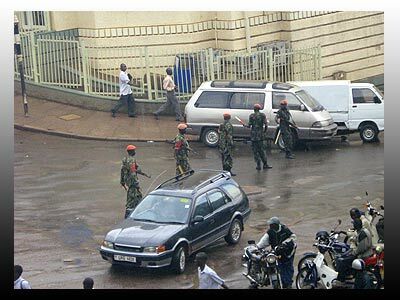 Calm finally returned to Kampala at around 3 PM after the military police took charge of the security in the city after the rioters overpowered the police. The shops in the city remained closed the whole day as a show of solidarity for the demonstration and fear for robbery. By 3.30 PM, the military police was still using force to chase people from the streets so that they return to their homes. Armored vehicles popularly called the Mambas were by this time still traversing the streets in an effort to discipline any rioter. 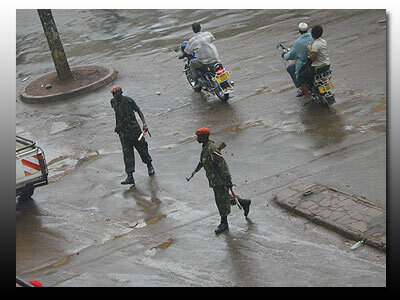 Armed military men on patrol in Kampala. The military police resorted to using live bullets and batons to disperse people who were seen in groups on the streets, some of them throwing stones at the police which was overpowered before the military was called in. The demonstration which begun as a peaceful march later turned violent after a misunderstanding between the demonstrators and the police. The demonstrators carried placards reading, "Indians remembers the 1971 saga" and others waved tree branches. The demonstrators are against the proposed giveaway of part of Mabira natural forest reserve to the Mehta group of companies to expand sugarcane growing. Mehta is an Indian who has been in Uganda doing the sugar production business since the 1960s. "People were demonstrating peacefully when there was a misunderstanding with the police. All of a sudden they opened fire," Frank Muramuzi, and environmental activist said although the police dispute the allegations. "The demonstration was peaceful but some hooliganism came later and people started throwing stones at police thus prompting the use of force," a police officer at the scene told Ultimate Media. The violence started when an Indian national knocked down a radio journalist working with a local radio station Radio One as he covered the demonstration. 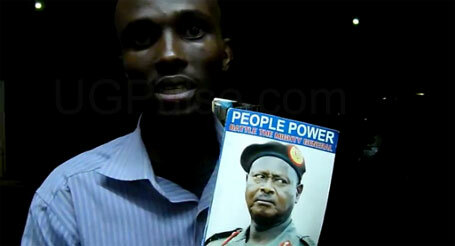 The accident ignited the anger of the demonstrators who claimed the Indians were 'anti-Uganda'. As the Radio One journalist was being taken to hospital, the angry mob ascended on the Indian, who had reportedly knocked down the journalist, and beat him to death, according to unconfirmed reports. Three more people are also feared dead in the riot. However police could only confirm two deaths. According to police, a suspected looter was shot dead by security guards and a stray bullet hit a passer-by. Ultimate Media can confirm the death of one Ugandan whose body lay in blood on Luwuum Street. The police who were this time using live bullet could not confirm the death of the Indian but there are reports that there have been several attacks on Asians, leaving two people in hospital and a Hindu temple for the Indians damaged. The police had to rescue about 40 men from a Hindu temple after it was attacked by a mob. "We were inside the temple and the protesters started attacking us from outside," 50-year-old Dipaul Patel told Reuters news agency. "It was very frightening," it quotes Patel as saying. At the central police station in the Center of Kampala City, some Indians were seeking police protection. The Uganda Peoples Defence Forces was brought in with armored vehicles to protect the Indian community that had sought refuge at the police. There are reports that the army escorted Mehta and a host of other Indians to Entebbe International Airport to escape any possible attack from the rioters. Some shops have been abandoned and there is fear that the employees would have a field day in case their employers left the country. This will not be the first time such an incident would be happening. In the 1970s, Ugandan Asians were expelled from the country and they were beginning to return to the country following a blue eye welcome from President Yoweri Museveni. Meanwhile, the anti Mabira demonstrators spearheaded by Save Mabira Crusade, a network of civil society organizations, individuals, MPs and religious leaders against the giveaway of Mabira forest have managed to present a petition to Speaker of the Ugandan Parliament Edward Ssekandi who promised to give the matter priority. The demonstration comes after several warnings to government and the Mehta group to withdraw they plans of degazetting Mabira. The Kabaka of Buganda Kingdom where the forest reserve is located has promised to give his land to Mehta to save Mabira forest. The Anglican Church in Uganda has also promised to give Mehta group land on which the company can plant sugarcane to save Mabira forest, one of the remaining eco-tourism sites in Uganda. The Mehta group insists in being given Mabira forest because of its economic advantages. But environmentalists argue that the cutting of Mabira forest could cause serious environmental impact to the country which is already facing reduced water levels in its lakes notably Lake Victoria, which the environmentalists blame on degradation. 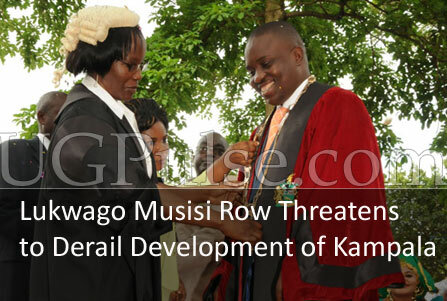 The environmental protection groups have since petitioned over the matter of Mabira give away. According to the Spokesperson of The Environment Action Network (TEAN) Phillip Karugaba, giving out Mabira for sugarcane is treasonable. TEAN says the move threatens existence of rare species of trees and birds in the 30,000-hectare forest. Despite the warning, the government remained unmoved by the threats.